She is a daughter of late running legend Bobby Doyle; he is her first cousin. They are both high school freshman, distance runners and members of two of the league's most high-powered cross country programs. Mackenzie Doyle, of La Salle Academy, and Nick Braz, a first-year man at Bishop Hendricken High, are heirs to Rhode Island's great running legacy, one initiated by distance man/marathoner/coach Bobby Doyle, who passed away in December of 2007 at age 58. Doyle, a member of the R.I. Interscholastic League and R.I. Heritage Halls of Fames, ran for Hope High in the mid-1960s, and later at the University of Texas at El Paso, where he was an All-American harrier. During the 1970s' and '80s he was a six-time Ocean State Marathon champ, and placed in the top 20 at three Boston Marathons. He also coached track and cross country at Woonsocket High. 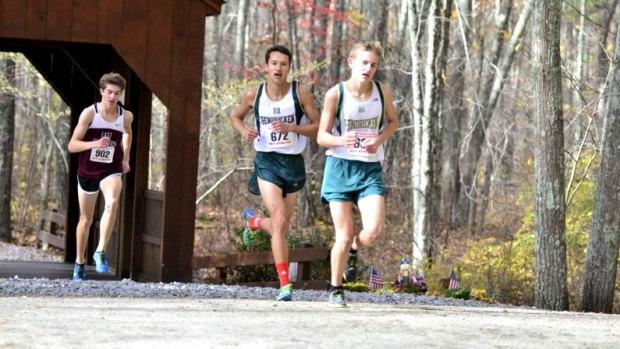 This past weekend, both Braz and Doyle were honoring that legacy, running on the "Covered Bridge'' course at Ponaganset High. Braz, a Tiverton resident, finished 12th at the state JV Championships. Doyle, who lives in Swansea, Mass., finished second in the girls' JV event. Bob Doyle's progeny reads like a "Who's Who" of local sports lore. Sons Patrick and Brendan competed in track and cross country while at Pawtucket's St.Raphael Academy in the mid-to-late '90s. Brothers Brian and Connor both ran for their uncle, Hendrcken head coach Jim Doyle. Now Mackenzie, Bob's youngest daughter, joins her cousin Nick in carrying on the family tradition. As with her cousin, Doyle hit the road as an eighth grader at Case Middle School in Swansea. "It's going pretty well,'' she said. "My team is so nice. We support each other,'' said Doyle, who finished sixth in the state at the Freshman Championships.